The Bob Marshall Wilderness is perhaps one of the most special opportunities for fly fisherman in the state of Montana. Think about if, how rare is it now a days to find true wild trout, not planted? Only a handful of guided pack and float trips are allowed here each year and the outfitters abide by a permit system that protects this fragile ecosystem. Because of this, the dry fly fishing for wild and native Westslope cutthroats is some of the best in the lower 48 states. Not to mention it is one of the only places in the Western US where you can legally target, and fish to the native bull trout. Let’s face it, most of the western rivers and streams are becoming so crowded that folks think the good old days are gone, but then there is fishing in the Bob Marshall Wilderness. 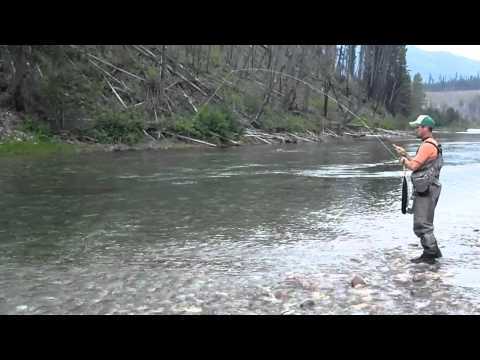 The south fork of the Flathead River hosts a wild cutthroat fishery that flows through the Bob. It is unique in that anglers can find remote campsites, solitude, and a ton of native westslope cutthroat. This is the making of a child hood dream, combining camping, incredible scenery and seclusion, and catching naïve trout on bushy dry flies. The South Fork of the Flathead begins deep in the Bob Marshall Wilderness at the confluence of Danaher Creek and Young’s Creek. It gains volume with the contributions of the White River, Big and Little Salmon creeks, Black Bear Creek, and other small tributaries. Overall, the South Fork flows more than 60 miles through designated wilderness and USFS before flowing into Hungry Horse Reservoir. The trout in this river are typically active, and on a good day, anglers with nothing more than an elk hair caddis may raise 30 or more fish. Westslope cutthroats are endemic fish that endure the variances of high and low flows. The hit attractor dry flies, not because they are dumb, but because they have to eat when food is available. When fishing for cutthroats try all the famous attractor dry flies like Black Humpies, Royal Wulffs, Renegades, and Trudes, as well as Elk-hair Caddis, Parachute Adams, Goddard Caddis, Caddis Variants, flying ants, and foam beetles. Cutties like it big, so use large hooks when you can (size 8-14). If you go low, try Pheasant-Tails, Hare’s-ears, Prince Nymphs, golden stonefly nymphs, caddis pupae, and Brassies. Seldom does a particular hatch demand a specific imitation. However, if you want to match the South Fork’s hatches, expect to see a smattering of Pale Morning Duns, caddis, and stoneflies. Terrestrials include grasshoppers, flying ants, and beetles. In addition, fall brings spruce moths to the water. You won’t see masses of insects like on other Montana rivers, but there are enough to trigger fish’s appetites. The South Fork is one of the few places in Montana where anglers can legally target bull trout. 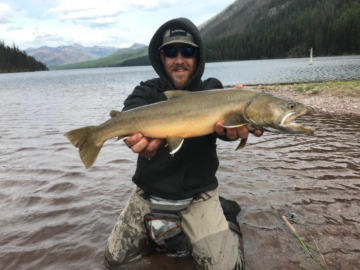 The river is loaded with bulls in the early fall when they run upstream from Hungry Horse Reservoir, but anglers can’t intentionally fish for them between August 15 and the end of the season. Fortunately, bull trout are present throughout the system in the summer. South Fork bull trout weigh up to 15 pounds or more and smack streamers, as well as the occasional cutthroat dancing on the end of an angler’s line. When fishing for bull trout use short 0X to 2X leaders and sinking-tip lines. If you’re using a floating line, tie on a 12- to 14-foot leader and apply plenty of weight. Bull trout hang near the bottom of deep pools, especially if there’s a tributary nearby depositing fresh, cold, clean water. The best patterns for bull trout represent sculpins and cutthroat trout. Carry mottled sculpins, Muddler Minnows, woolhead sculpins, Double Bunnies, rubber-leg Woolly Buggers, Zonkers, and Clouser Minnows. Large, heavy stoneflies and golden stonefly imitations, also work.